Yes! 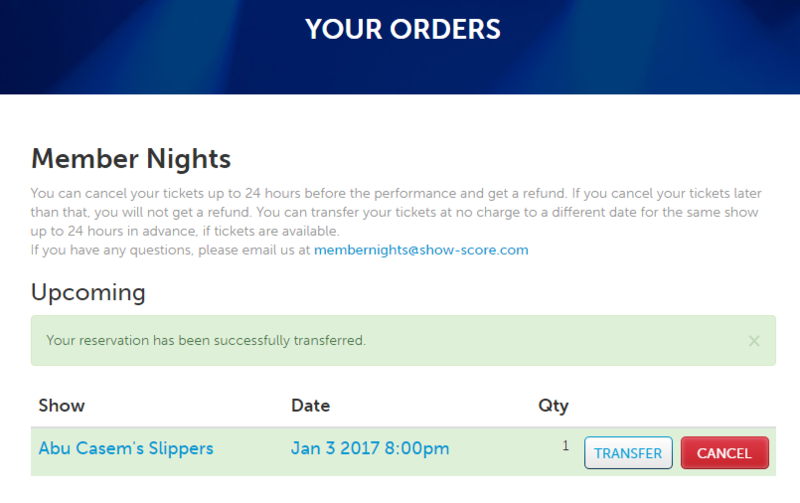 You can change the date of your Member Night reservation as long as there are tickets available for another date. Ticket transfers must be made at least 24 hours prior to the show. 1. Go to the "My Orders" page, either by following the link in your email or small drop down triangle at the upper right hand corner of the website and clicking "My Orders". 2. Click the "Transfer" button next to the show you'd like to change. 4. Choose the date that you want and click "Transfer". 5. You will see a message confirm "Your reservation has been successfully transferred." You will also receive an email confirming the change. You can transfer your reservations to any available date. Transfer cannot be made the same day as the Member Night you currently have reserved. Email us at membernights@show-score.com to check if we can still accommodate the transfer.